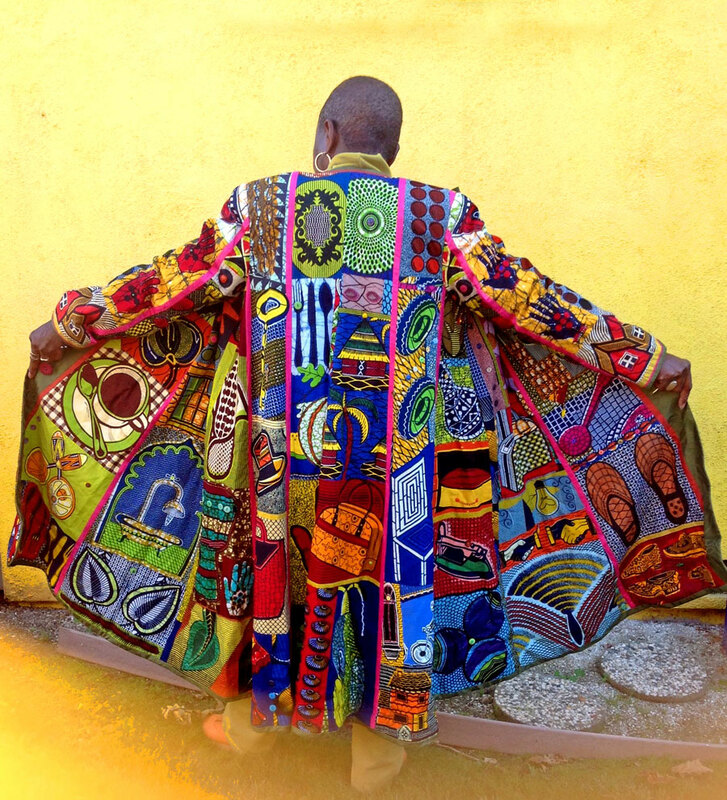 Rachel Clark’s one-of-a-kind wearable quilt pieces are some of the most colorful, intricate, and personal examples of fiber art I’ve ever seen. 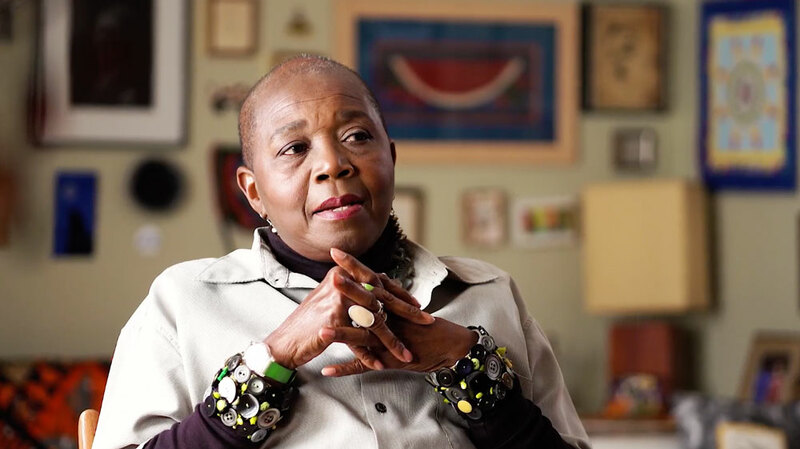 Rachel Clark is a quilter, but she’s also a fashion designer, storyteller, and a highly-quotable sage who has as much wisdom as she has creativity. I can’t wait to introduce you to her… in blog form. "I just think that everybody has a story. How you tell your story is important… it defines who you are, and also leaves a footprint… where you’re coming from, and hopefully where you’re going." Because of all of the seamstresses in her life, Rachel said she didn’t have to find who she was – she already knew. She was a fiber artist by birth. After years of marriage and raising a son, Rachel's husband died unexpectedly, leaving her depressed and lost. Hearing her talk about this on her Patchwork Nation episode is heartbreaking. But then, in almost the same breath, she picks herself up and shares a conversation she had with herself and a decision she made to be a survivor. "We have survived slavery. We have survived The Depression. We have survived the loss of husbands and children, and you are going to lie in your bed and whine about what has happened to you? Life goes on. You get up, and you move on." After that turning point, Clark decided to pursue some of her life goals with new vigor and passion. 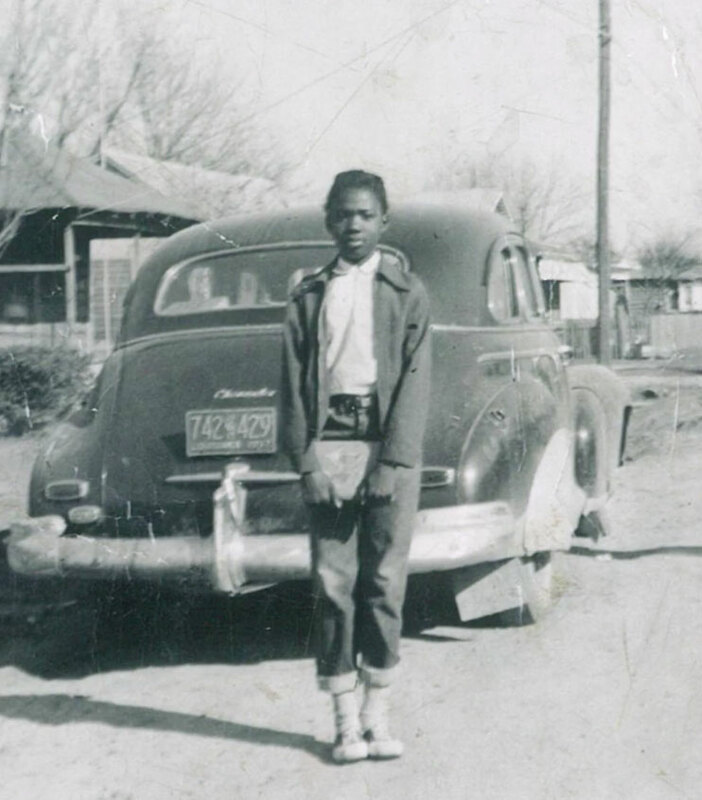 One of those goals was to teach sewing around the country. 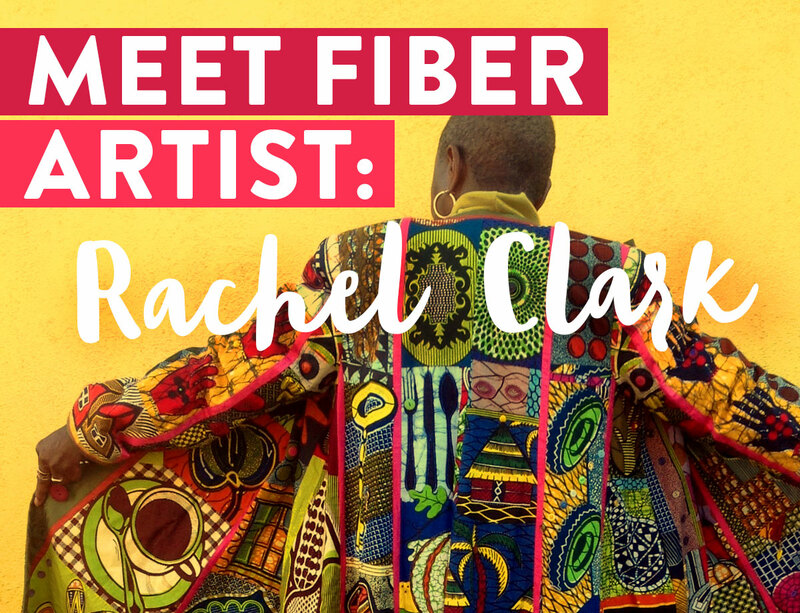 A planned 3-year stint turned into a 25-year tenure that still continues today, as Rachel Clark inspires others to express their thoughts, feelings, and even their struggles through fiber art. Clark's work is full of excitement, color and an eclectic use of materials and prints. 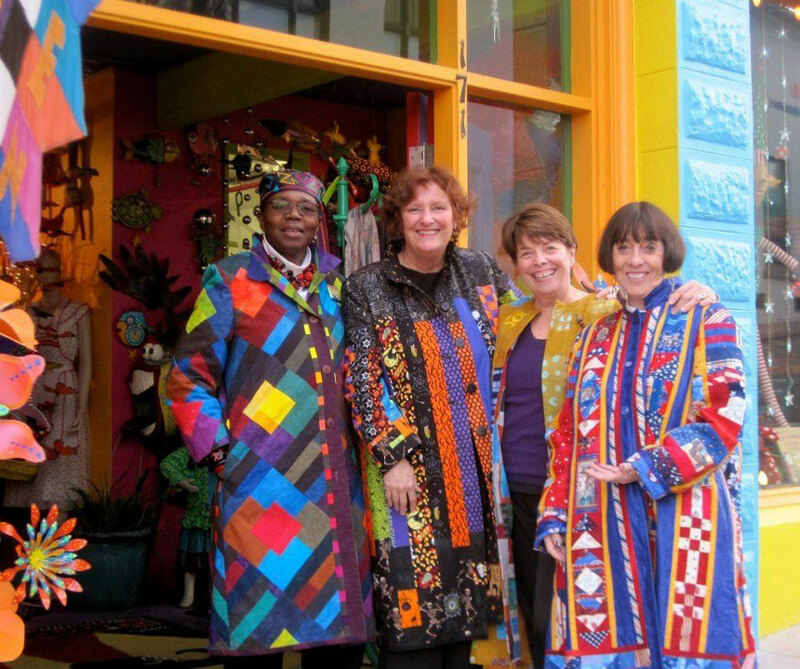 She uses her interest in quilting, color, and high fashion to create unforgettable wearable quilts that explore themes from politics to farming. She uses anywhere from 5 to 175 different fabrics in any given piece, often waiting for years to finish a project until she finds just the right fabric. Clark likes to teach her students to create art that depicts “your truth.” All of Rachel’s pieces are highly personal works of art that have helped her find her voice, and share her values with those around her. After her husband died, some people told her that she should go back to school and “get a real job,” but she trusted herself, and decided to dive even deeper into her craft, and she coaches other artists to do the same. What's Rachel Clark Doing Now? Rachel Clark continues to teach sewing while creating her own whimsical wearable art pieces. 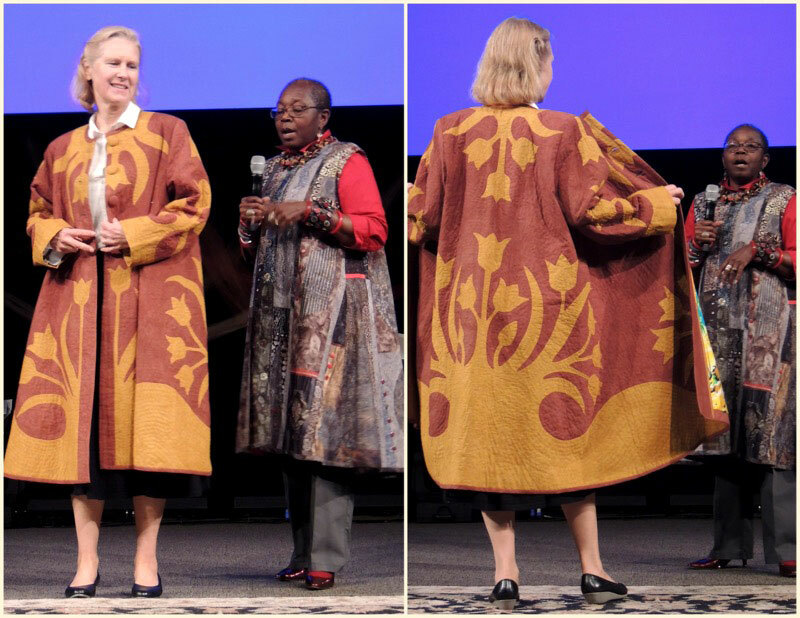 She has toured nation-wide with her one-woman fashion shows, and has been featured in many magazines like Threads, and “The Quilting Quarterly” on HGTV’s Simply Quilts. She now has her own pattern line, RDKC Patterns, which includes patterns for coats, vests, and wall quilts. She has also published a booklet on wearable art techniques. Have you taken a class or been inspired by Rachel Clark? Let us know in the comments! 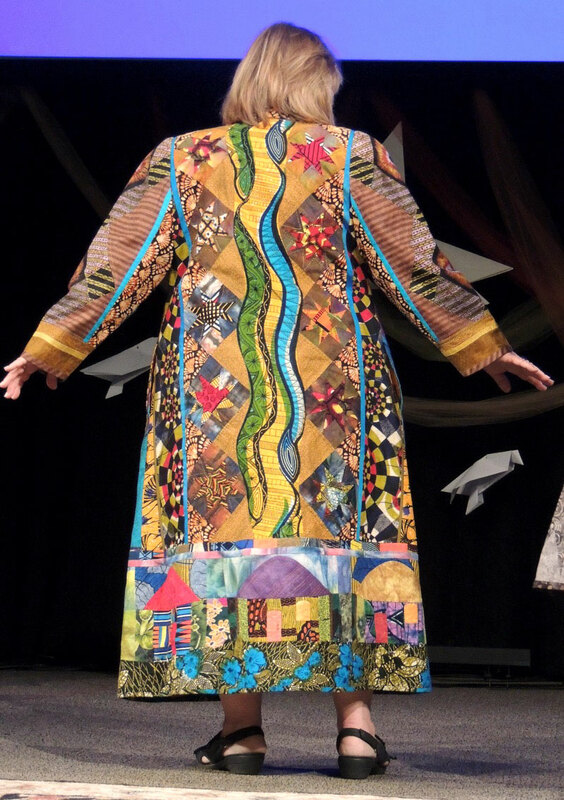 I attribute Rachel Clark for starting me on an incredible journey of sewing wearable art. I sewed with the idea that you bought the pattern, fabric and notions to make each garment. Never had I purchased fabric just because I loved it, with no plan in mind. I took a class from Rachel and it changed my world. I will be soon presenting, for the first time, a fashion show of my own of wearable art garments to a group of local women. Thank you Rachel. That is SO awesome! congratulations! I wish I were nearby so I could attend! Such an amazing work of art. I have been following the works of Rachel Clark for some time. I love her very colorful and eclectic pieces and hope someday to meet her in person. She is an inspiration and her works speak loudly to me. I consider myself to be a very lucky chick for having met and learned from Rachel. I’ve even contributed some very small blocks to her “house coat” and to her collection of interesting bits for future creations. She is truly an inspiration. I had never heard of Rachel Clark before, but boy did this post make an impression! I am off to find out more and perhaps try my hand at this type of quilting. Thank you for bringing this inspirational woman into my world! Thank you so much for this series! I’m truly inspired by these wonderful people. Rachel needed some serious yardwork done. My husband is a landscape arborist. I met Rachel at church and adored her work and longed for one of her creations. I was willing to pay the going price! As it turned out my hubby traded work for my fabulous original Rachel Clark creation. It’s called ‘Jenny’s Blues’ and everytime I were it I feel special and blessed! WOW! That’s such a great trade! We have been extremely lucky to have Rachel Clark teach at our Fairbanks Summer Arts Festival. I only took her classes once but it inspired me to make about 20 beautiful bags as gifts. I’m determined to take another class and make a coat! I took a class with her years ago! She continues to inspire me! I have loved Rachel’s work for years. She has a great use of color and different fabrics. She has several patterns that work well with all types of fabric. Rachel, you have come a loooong way, girl. I am so happy for you and the recognition that you are receiving for your well deserved artistry and ability to teach and encourage countless people. I am proud to be in that number. Carry on. Keep shining. See you in December. CONGRATULATIONS!! Thank you for bringing Rachel Clark to my notice. she is amazing. I LOVE her work and look forward to exploring and hearing more about her. 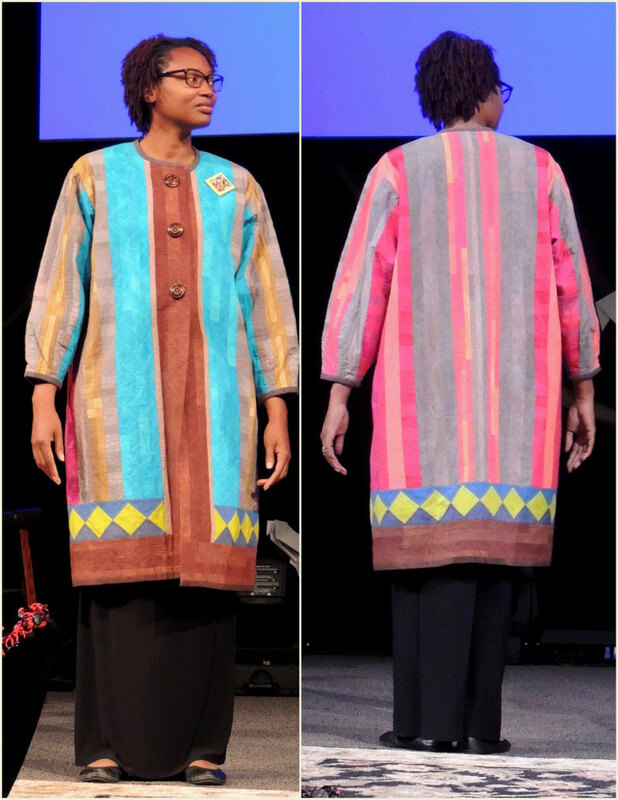 I would love to make myself a coat of many colors and patterns. WOW …. I have never taken a class. But I’m inspired. I remember seeing her jackets/vests/coats years ago at QBL. In fact I wore one in a fashion show. But what I remember most about her (beyond her beautiful clothing) is her collection of bakelite bracelets, which I started collecting after that. Rachel is an amazing person first, and also an amazing artist. She has inspired me for 20 years and I’ve taken several of her classes. If you follow her on Facebook you can also see the abundance of her creativity and projects as she is working on them. She challenges me to take my garments in different directions and inspires me like no one else. It’s so fun to see my friend Rachel on your site! I took my first class from her in the late ’80s–oh my that’s a long time ago. She is an inspiration! I took a class with Rachel Clark in Lancaster, PA 25 years ago. I found her to be a fun, patient and a highly skilled teacher. We laughed as much as we sewed. I fell in love with her work and have been following her every since. Several years ago Rachael lectured and gave workshops for my guild. I hosted her at my home for three days. She was a hoot, so full of energy and fun. I had a dinner party for her on her last night and a good time was had my all. I did attend her workshop and I learned a lot from her. Do you supply print paper patterns.